Here we bring you an all in one inclusive package for you MKIV Supra. 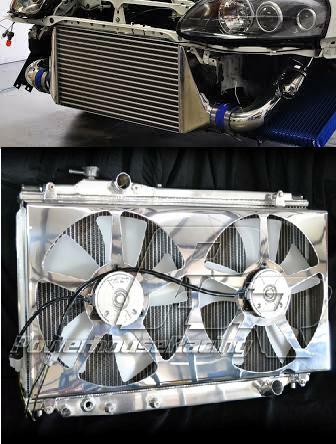 In this combo deal you will find the GReddy 3-Row Front Mount Intercooler for the Supra. Known to be able to flow enough air up to 1000rwhp. A beautiful core with high polished end tanks and even a new power steering line so you do not have to bend yours as you do with other kits on the market. Adding into this combo package we have the Koyo Radiator and radiator cap. Known as one of the best radiators on the market you can rest assured heat issues will be a thing of the past. Wrapping up this bundle we have the PHR IS300 Fan Shroud in NON POLISHED finish. This shroud allows you to utilize the factory Lexus IS300 electric fans known as the ONLY fan to produce more CFM than factory for the MKIV platform. Bundled together you have the absolute best of the best in terms of cooling and the piece of mind knowing your setup can sustain up to 1000rwhp with ease!